This delivers frequencies using the Phoenix Principle for addictions, emotional issues, normalizing/balancing, anti aging/regeneration, pain, veterinary and other applications not involving the prevention, diagnosing or treating of disease in humans. It is a state of the art, professional quality electronic device using direct contact noble gas-filled tubes, suitable for clinic or home use. The latest in direct digital frequency synthesis from an experienced research team. Two probes form a concentrated high energy pathway to deliver radio, light and plasma waves in addition to a micro-current without metal-toxicity. 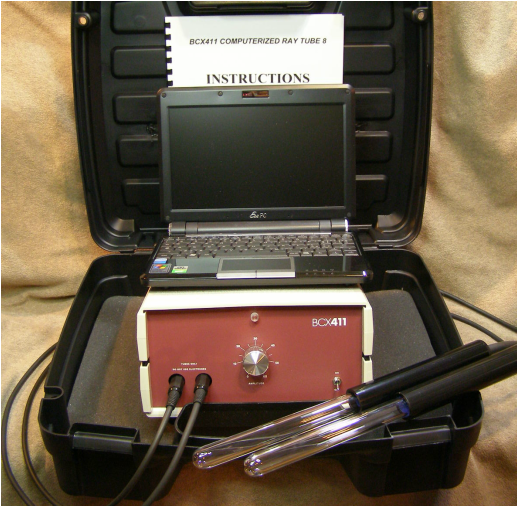 Operates over 100 KHz, easily handling any frequency using the Phoenix Principle. Noble gas-filled tubes direct the energy where it’s needed most. The computer is an 11.6" notebook, saving space and weight for portability. Comes with a specially configured optical mouse that allows for operating the computer while running the system. The sophisticated software is also very simple for the beginner, allowing the user to pulse, sweep, converge, change duty, etc. or simply type in frequencies and "run". Comes with instructions in the computer as well as printed equivalents. The MHz AMPLIFIER plugs into the back delivering up to 20 MHz with body contacts. The STAR SHIP or PROFESSIONAL TRANSMITTER plug into the back for hands free sessions. The BCX411 TURBO plugs into the back to double the plasma energy for faster results. 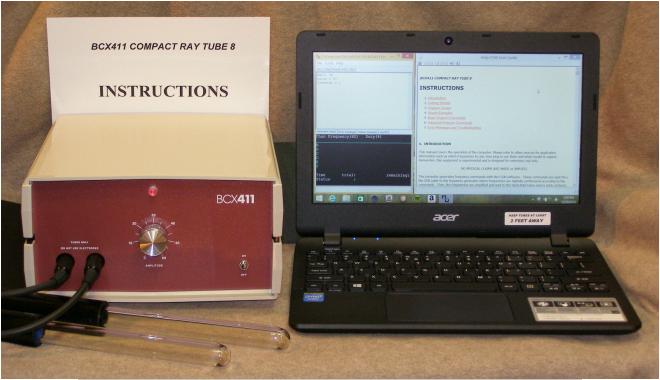 BCX411 COMPACT RAY TUBE including two noble gas filled tubes, 11.6" notebook computer, optical mouse and instruction manual: Call 425-772-2278 for pricing. Same power, sophistication and options as the COMPACT RAY TUBE.